Pi in the Sky by Wendy Mass. Grades 4-7. Little, Brown, June 2013. 244 pages. Reviewed from ARC provided by publisher. Joss may be the seventh son of the Supreme Overlord of the Universe, but he'll be the first one to tell you that doesn't mean anything. Out of the seven siblings, Joss is the sixth smartest, and while his brothers have important jobs creating planets and species and designing sunrises, Joss's job? Is delivering pies. Yup, pies. But when circumstances lead to the removal of Earth, everyone's favorite planet, from the time stream, Joss is charged with recreating the Earth. Recreating it exactly the way it was originally formed so that humans evolve in the exact same way. This may be a heavy duty for a kid who got a C in his Planet Building class, but everyone's counting on Joss! This book is middle-grade gold. Middle-grade science fiction stories that aren't dystopian are few and far between at the moment and this novel hits all the right notes. It's funny with Joss's self-deprecating voice and confusion between life in the Realms and life on Earth. And I love how Wendy Mass includes lots of factual information about the makeup of the universe without bogging down the story. That's something I loved about her contemporary novel Every Soul a Star, too. The plot meandered a little for me in the beginning, but it really comes together about a third of the way through when Joss and his compatriots start earnestly trying to figure out what Earth is made of. Carl Sagan makes a guest appearance (and not just in the quotes from scientists which start each chapter). This is a great choice for kids who like funny stories with heart and/or science fiction with a lighter tone. The light-hearted and humorous tone of the book combined with interplanetary issues brought to mind Larklight by Philip Reeve. The historical sci-fi setting of Larklight differentiates it somewhat, but I think the overall tone and voice of the books are similar. If kids are looking for another light-hearted interplanetary romp, Larklight is the way to go. Readers may be familiar with Wendy Mass's other works, but if they haven't read Every Soul a Star, they should do so immediately. Mass employs the same skill at interweaving scientific facts in a solid friendship story as she does with Pi in the Sky. 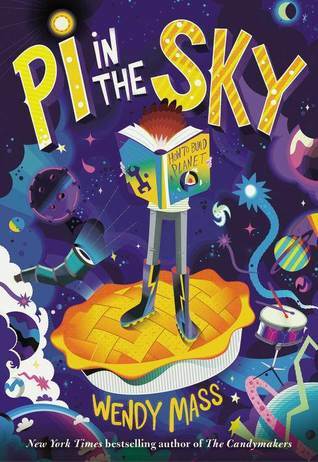 Pi in the Sky is on shelves now!